Strange films are always challenging films to review. They often share similar awkward traits, they’re often cluttered with seven ideas too many. The finale usually leaves our hands scratching our heads. You care to take a guess as to where my hands were as Downhill barreled toward its littered climax? I’d love to sit back and tell you that Downhill was everything I’d hoped it would be. If I did so, I’d do so knowing that my mirror would reveal to me a bold faced liar. Downhill wasn’t the masterful trek into survival horror I’d envisioned. That said, it isn’t a throw away picture, either. It’s got a few good things working in its favor. The story takes about six left turns before reaching its final destination. And each of these strange little decisions call for a little explanation, but as has been the case with a few different features I’ve covered recently, it’s going to be tough to give you a fair glimpse of this tale without eliminating a handful of surprises in the process. It’s always hard for me to do that. Spoiling a film, in my mind is just as bad as pirating films without ever even contemplating supporting the tacticians who make these beautiful gems a reality. After his best friend dies in a racing accident, biking star Joe agrees to go back on the wheels for an exhibition in Chile. On a test run with his girlfriend Stephanie, they stumble upon a badly injured man dying from a mysterious virus. That’s the start of a very bad day for them as they become the target of relentless killers ready to do anything to keep their secret to go out of the mountains. That doesn’t at all do justice to the overall craziness of the story. It’s totally and completely nuts, and quite often feels far too murky to see what’s coming at you or, amazingly, what you’ve already passed. To say there are a few strings that feel left to dangle is an understatement. To say that the end result makes perfect sense is a falsification. There are a lot of holes that were punched through this production that remain unpatched. But by the time the quizzical sequences arrive, they’re all but fading into the background, the viewer left to fight for the chance to keep up with the odd maneuvers the film employs. It really is a strange, atypical affair, but it makes for some solid fun. There are a few relatively savage shots that come off as impressive, and from time to time we see flashes of brilliance from the attached thespians. And I can’t neglect some of the location choices, as we get some deceptively warm and embracing visuals from these shots. The movie doesn’t look half bad for an indie film. It’s obvious that there isn’t a bank franchise invested in the production, but Patricio Valladares does everything possible to convince viewers they’re seeing a grand, and broad production. 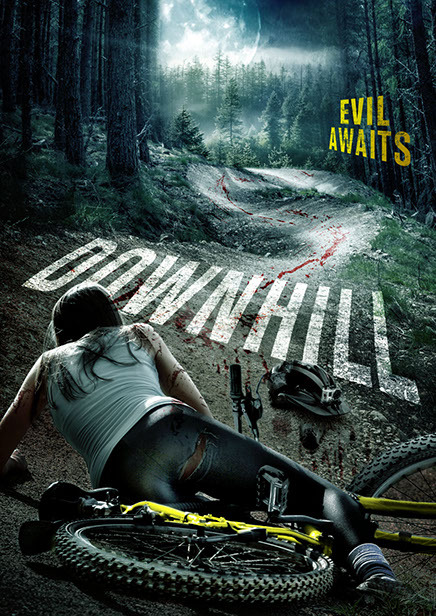 Downhill has a heartbeat that a lot of smaller productions can’t relate to. It feels like a spectacle with a mind of its own, and that adds a strange charm, but it also amplifies the loose design of the screenplay itself. So, there’s a bit of a double edged sword here, swinging through a production that no doubt wants to be remembered. While that sword may do some damage to Downhill, it doesn’t destroy it beyond repair. No, this is a flick that won’t be remembered long, but it will frighten a few, and it will do some very positive things for a large portion of the crew involved.